Embossed silicone wristbands are another turn on ordinary arm ornaments. With this band sort, your modified message and work of art are raised over the band giving the wristband a look that is all its own. Initial stage embossing can be accomplished during the modeling process. This can be a continued process for wristbands and ID tags. An essential thing is to add the text and graphic into the mold before putting the material in. The text color of your debossed or embossed band should be unique for which high-quality molds are built. The unique color of the text presents an extraordinary color palette that makes your band the best amongst all other brands. As we all know that embossed wristbands are not very common but it is the best option if one is looking for something unique and stylish. It can include any sort of custom design and is available with affordable pricing and excellent turnaround times. Custom made wristbands free shipping is available. 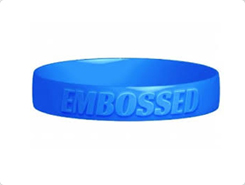 At WristbandBuddy, we offer 100% latex free embossed bracelets which are medically approved for sensitive skin. We offer timely delivery of your order along with free packaging. There are no additional charges for artwork and design. 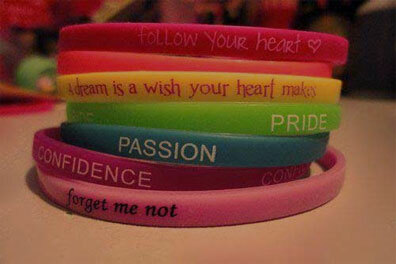 Buy Custom Made Silicone Bracelets from our online store and get free shipping in USA.